I'm planning to install OpenProject on OMV 4 for my team to manage project milestones and other PM tools. OpenProject does support Debian 8/9 as per their installation guide. Can anyone please tell me how can I install it on port [XXXX] & also be able to manage it? What about installing Debian 9, net install which is the minimum then omv would that be a solution, there is a thread on here but I can't find it. Will try this and let you guys know. I found in the documentation of open project, that there are limitations when using open project with nginx. They propose to use Apache. But you cannot use Apache and nginx (OMV) at the same time. Can I use NginX instead of Apache webserver? Yes, but you will lose the ability to enable Git/SVN repository integration. 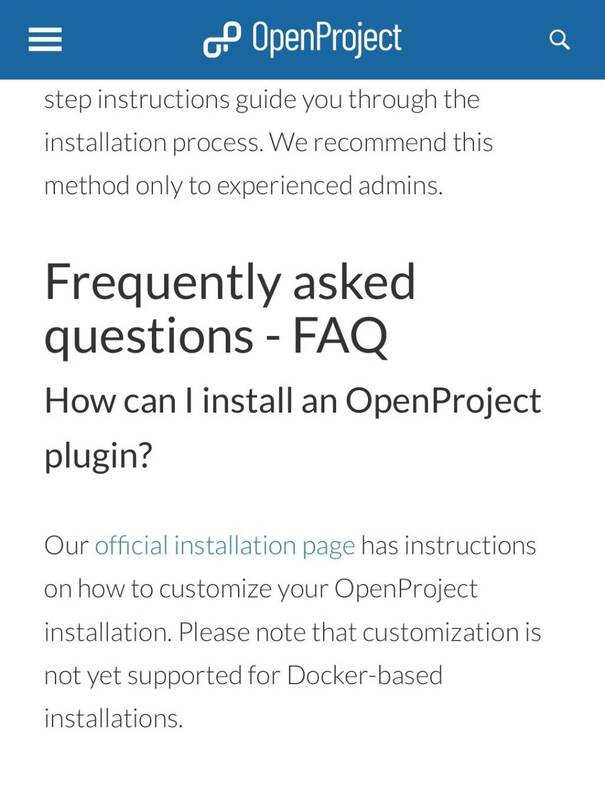 Note that the OpenProject installer does not support NginX, so you will have to ask to disable the Apache2 integration when running the installer, and then configure NginX yourself so that it forwards traffic to the OpenProject web process (listening by default on 127.0.0.1:6000). But you cannot use Apache and nginx (OMV) at the same time. No nginx or No Apache.. NOW WHAT? So what is the solution to setup OpenProject on OMV4? What about Virtual Box on your OMV? Maybe I am wrong and you can use NginX and Apache in parallel. A google search revealed some results. Might be worth a try. VirtualBox option seems more relevant to me for the moment. But I will also try and run - Nginx and Apache in parallel, that way I can test the performance and limitations in both cases. hello i have openproject now running as a docker and it is now running for several days active usage problem. Now my question I would like to allow 2 work colleagues access. But you are not with me in one location. That means I would have to somehow create a release for it in NginX. does anyone have any idea how best to do this? I hope the post here in the topic is correct.